Dreams, visions and compelling attractions. 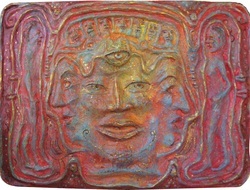 If you look on my gallery page you will see jesters, foxes, gods with a third eye and other pieces inspired by my muse. 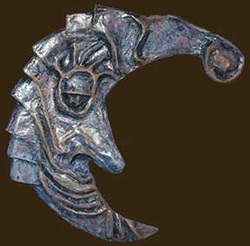 I have created two God With Third Eye sculptures. The third eye means inner vision, the power to see within. ​Fools, jesters and foxes, why was I drawn to those archetypes, and what do they have in common? Fools, jesters, clowns and animal trixters, like the foxes and other animals in folk and fairy-tales, bring new, creative energy into our lives. These paradoxical shape shifters shake things up and revitalize us. If you dream about foxes, get the fool in a tarot reading, or feel drawn to jesters and clowns, you may be ready for a change. You may be afraid of being too fool hardy but without them to mock your over serious tendencies, life could get deathly dull and predictable. The fool reminds you to open up, laugh at yourself, lose that critic and start exploring new ways to express yourself. It is important to artists especially. The fool tells you to experiment with new mediums, new color pallets etc. But most of all... just have more fun! I was studying computer skills because I wanted to put a blog together. I developed a condition I call brain freezle. You might ask, what is brain freezle? It's that sensation of getting stuck at the same place every time. Your mind freezes and then fizzles out into a chem trail that dissolves and looses information down some black hole closely akin to the place where lost socks go, never to be seen again. After working for awhile at the library I walked toward downtown Olympia for a coffee. I had been trying to do some simple thing around a thousand times without getting anywhere. I heard an all to familiar voice say, "You can't do this stuff, you're old and to nutso." Not to long after that I heard another voice. It was coming from the imaginary parrot that I had all of a sudden acquired which was riding on my shoulder. I felt the weight of it sitting there, right next to my ear, real as rocks, and it was saying over and over, as parrots do, "Don't give up, don't give up, don't give up." I knew it wasn't really there so don't think I've really lost it. But I knew then that I had to create a parrot. I had to get the parrot energy into my life, design it, paint or sculpt its feathers, fashion its little beak with my hands to manifest it as a totem animal and work with its energy. Later a student in my class was feeling lost and I told her I understood. I told her about my imaginary parrot and said I would loan it to her. She wrote back and thanked me. So many things come into our lives, from dreams, from literature and from movies, from everyday experience, that seem to have a special significance. It is not enough to just think about them. It is much better to create them in some physical way, to sing them, dance them, create physical objects of them.